MRI is a painless and harmless way of looking inside your body without using radiation. MRI uses magnetic fields and radio waves to scan your body. The radio signals return information that conventional x-rays are unable to provide; each type of tissue sends out a different signal that create a clear, detailed “picture” of the area examined. The patient should refrain from wearing clothing with metallic ornaments such as hair clips, zippers and buttons. Patients should not drink or eat anything six hours before the test. Magnetic Resonance images are produced by a computer that detects changing magnetic fields and translates them into pictures of slices of the scanned body part. 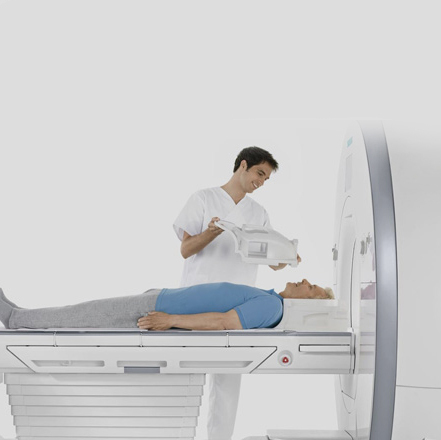 During a Magnetic Resonance the patient will lie on the examination table and will have to remain still for the length of the procedure which varies depending on which body part is being scanned and if contrast is administered. All of our diagnostic examinations are interpreted by Board-Certified Radiologists. The results of your Magnetic Resonance will be sent to your referring physician as soon as they are interpreted. It is the patients´ responsibility to contact their referring physician to discuss the results of their examination and ask for further recommendations.